Standing in the middle of Topolobampo, tables cleared, I clutched my notebook and braced myself as “Get ready. They’re coming!” was called across the floors of Rick Bayless’s restaurants. And come they did. To taste the farm fresh produce, eggs, meat and more brought by farmers who drove in from across the Midwest to tell their stories and hand over their wares to the skilled hands of Bayless’s chefs and sous chefs. The gathering was the sixth annual benefit for the Frontera Farmer Foundation, a nonprofit that provides grants to small family farms serving the Chicago area. For $45, guests received a veritable cacophony of foodie delights. Over fifteen tables of sustainably raised, expertly prepared, diverse food options – from coriander cured salmon to a Mediterranean wheat berry salad and goat cheese stuffed tamales. I couldn’t eat enough of the crisp meringues with lavender cream, strawberries and mint. And to be able to ingest one after the other while getting to know Jeremy McWilliams, a seventeen-year-old who started Little Farm on the Prairie in 2003 (I’ll confirm your math – he was 11! ), and supplied the eggs for the dish, made those meringues taste even crispier. McWilliams was the recipient of one of over forty Frontera Farmer Foundation grants given out over its seven year history. This grant allowed him to buy an egg washer, thus increasing efficiency and growing his business, which grossed $45k last year. P.S. He’s in high school. I also met Terry and his wife who own a cattle farm called Raising Acres which is transitioning to grass fed cows. They were attending on Sunday to represent Stewards of the Land, a group of which they are members, based in Fairbury, IL. Stewards of the Land is made up of families committed to sustainable farming and high quality products. Most of their members are families with children and thus they aim to foster an environment and an economy where those children can have the possibility of staying “on the family farm”. The group sells not only to award winning restaurants in Chicago but also to local Fairbury grocery stores. I didn’t have a single food experience that didn’t leave me both satiated and inspired. Other standouts included the green garlic soup with scapes from City Farm, goat cheese stuffed tamales from Prairie Fruits farm and the bacon studded white corn polenta with agave syrup from Spence Farms. While eating my third polenta cake, I learned about Will’s business tapping maple syrup. Another high school student (although not the norm, I found the high number of young farm owners in the room surprising), Will was attending with his family who follow generations of farmers in their trade. Will, like Jeremy, impressed me with his entrepreneurial spirit, business acumen and sense of familial pride. Will was taught the syruping technique by his grandfather, who was featured in a 1952 newspaper article which Spence Farms had copies of on hand. Having spent the previous morning at the Green City Market (GCM), there were similarities between buying from the farmers and chatting with them while you ate their food. I heard quite a bit more about GCM during a chef demo Rick Bayless and his test kitchen director Deb gave where they made a wilted spinach salad with an amazing Mexican chorizo dressing. 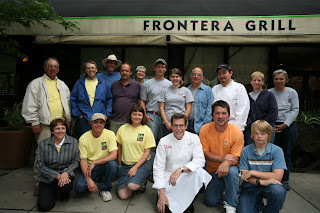 During his cooking, Bayless spoke of the origins of the Frontera Farmer Foundation – where early in the restaurant’s days a number of farmers the restaurant worked with were on the verge of bankruptcy when often they only needed one piece of equipment to keep their business afloat. So the restaurants started working out a deal where they would provide a loan or purchase a piece of equipment and the farm would repay the loan in-kind. Encouraged by these experiences, the Bayless’ and their staff wanted to formalize the process of helping to promote and preserve farm communities and support keeping farmers on their land so they could do the work they wanted to do. To date, Frontera Farmer Foundation has provided almost $600,000 in capital development grants to encourage thriving farm communities that supply Frontera, Topolobampo and others. Grants are available to all farmers, not just those who supply Bayless. Grants are reviewed annually by three individuals who make up the Grant Making Committee. Selected recipients are awarded the funds at the beginning of each year, at the start of the growing season to help create an impact for that year. Bayless shared a story about a recent day in the restaurant when the staff decided to play a game. Looking around at the ingredients in their kitchen, they counted those for which they could associate a name or a face. Impressively, 85% of the products fit into this category. Supporting local, sustainable family farmers helps us all - from an ecological, economic and gastronomical perspective. But the essence was captured by Rick who, scraping the chorizo dressing onto the spinach, noted, “you can’t have great restaurants without great agriculture.” And if I didn’t believe it before, I think that spinach salad would have helped to change my mind.